Healthy sweet treats just in time for Easter that are so delicious, you’ll think they’re a guilty pleasure! Lemon is the ingredient that holds these treats together! It is packed full of nourishing elements and it’s tart flavor give these versatile bites that tangy added punch of flavor. Lemon contains cancer fighting flavonoids, vitamins, and minerals that have been used for generations in preventing a long list of ailments. In fact, it has been used as an antiseptic agent and natural medication for complications including high blood pressure, indigestion, and respiratory disorders. Anti-inflammatory walnuts, heart-healthy coconut, and cholesterol-lowering sesame seeds are also rolled together to make this treat a must eat! This recipe is so incredibly simple, you can whip these up easily for an after dinner dessert, a nutritious and kid-friendly snack, or to keep on hand for when those mid-day sweet cravings hit! 1. Place dates, walnuts, sesame seeds, lemon juice and zest in a food processor. Pulse and blend until completely mixed. The mixture will be slightly sticky. 2. With dampened hands, roll tablespoons of the mixture into balls. 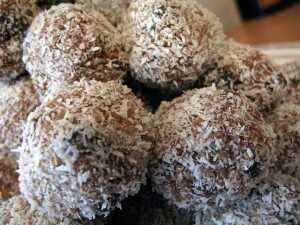 Roll balls in coconut and chill until ready to serve. Don’t sacrifice dessert – just replace it with healthy options like these Lemon Treats and keep fighting cancer in the kitchen!